minds. Ideal for bone health, immune and metabolism support, eye as well as overall health of children. Great taste guaranteed. 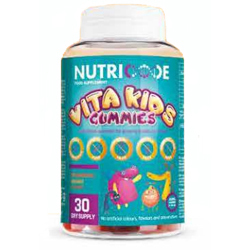 They meet the daily needs of kids for the most essential ingredients! Contain vitamins A (75% of the daily demand in 1 gummy*), D (100%), E (112%), B6 (71%), B12 (160%), C (37%), biotin (150%), pantothenic acid (83%), iodine (27%) and zinc (25%).